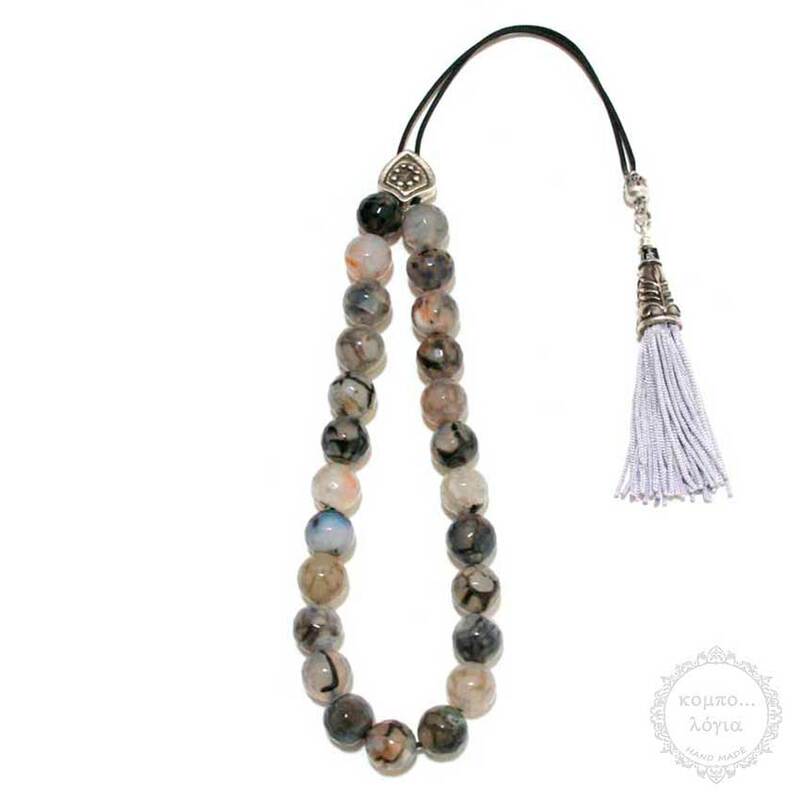 Flare Agate handmade komboloi created with 25 natural Gemstone Agate round faceted beads of 12mm diameter with original tibetan silver metals, 36cm total length, 28cm + 8cm tassel, and 72g total weight. It comes with a free leather vintage pouch. Agate is one of the oldest of healing stones. As a stone of strength, it was used in ancient civilizations, on the breastplates of armor, to bring warriors strength and make them victorious in battle. Agates are very protective stones, making them the perfect stones for amulets and medicine bags. They also bring us courage, emotional strength and self-confidence. IGS (International Gem Society) Agate is a variety of chalcedony, a cryptocrystalline form of quartz. Translucency, patterns of color, or moss-like inclusions may distinguish this stone from other forms of chalcedony. Agates can show a wide variety of vivid, multiple colors. These are principally the result of traces of oxides of iron, manganese, titanium, chromium, nickel, and other elements. All agates take a wonderful polish and are tough enough for most jewelry uses. Designers often take advantage of the intriguing patterns these stones have to offer to create unique and fascinating pieces. Etymology: From the Ancient Greek Achates, the name of a river in southwestern Sicily where the material was found.